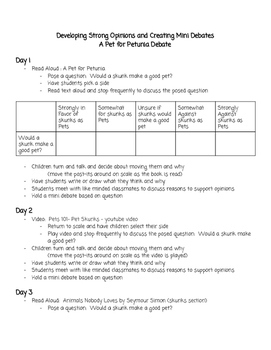 These lesson plans will start with the anchor text, A Pet for Petunia. The students will have mini debates daily and will end the week long thought Would a skunk make a good pet with a large debate and writing long about the question. The lessons use literary, informational, and videos to help students think about the question. the students are always thinking about the question and talking about their thinking. They do turn and talks each day multiple times. These lessons will allow students to expand vocabulary, participate in close reading, and writing about their reading. 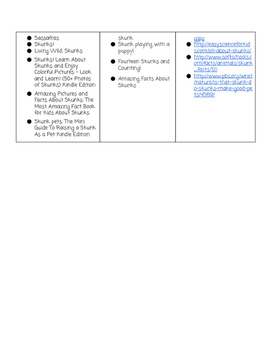 I have also included extra resources that could be used to extend the lessons or you could change out the resources in the lessons that would work best for your students.